I’m about to share one of my favorite projects to date! For the past couple of months I’ve been looking for a large piece of art to hang on one of the walls in the office, but I just couldn’t find anything that I liked for that space. 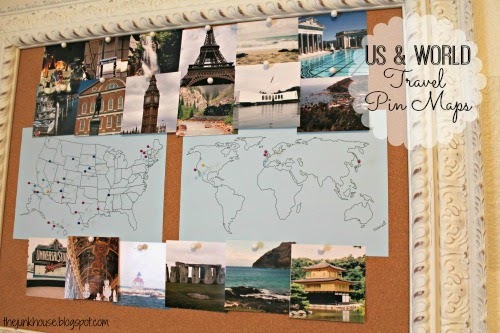 Coincidently I’ve wanted to create a travel pin board for awhile now…probably since I saw this one in Young House Love’s gallery hallway, so this seemed like the perfect solution. I wanted a US map and world map, so my original plan was just to buy couple maps, back them with cork and hang them on the wall. Turns out it’s hard to find matching US and world maps that aren’t massive. So I moved on to Plan B – the DIY version. I started with this corkboard from Hobby Lobby. It was originally $69.99, but it was on sale so I only paid $34.99. Actually I had a gift card leftover from my birthday, so I didn’t pay anything for it. Then I used my Silhouette to draw the United States and world maps. 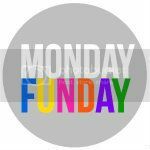 I bought this shape for the states and this shape for the world (99 cents each from the online Silhouette shop). I also bought the Silhouette sketch pen starter kit from Amazon for $15.50 (although now it’s $19.99) for this project. I have to say that I absolutely love the pen set. I never really thought about using the Silhouette to draw things, so my mind was blown watching it draw out my maps! I cut the maps to the same size and used double stick tape to hang them on the corkboard. To mark the places we’ve been I just used sewing pins. Places I’ve been are marked with fuchsia pins, places my boyfriend has been are marked with navy pins, places we’ve been together are marked with teal, and home is marked with a yellow pin. I only marked places if we actually spent time visiting or sightseeing…airport layovers didn’t count. I love how it turned out, plus it was fun asking my boyfriend about places he’s been. I didn’t know he’d been to Mount Rushmore! I think it’s funny that my pins are mostly around the coast and his are mostly inland. I decided to use the rest of the space on the board to add pictures from our various trips. I cut them all into 4”x4” squares, so they’d be uniform. I missing some pictures from trips I took pre-digital camera days and I don’t have pictures from my boyfriend’s trips, but it’s a start. There’s still plenty of room to add more pictures too! Seeing all of those blank states really makes me want to hop in the car and road trip up the west coast and through the mid-west. Too bad I don’t have enough vacation time to do that! Since we are talking about vacation plans - this seems like the perfect time to share the news about our next “teal pin”. Yep, we’re headed to Alaska in July to fish the salmon run! We are flying in a day earlier than our friends so we’ll have an extra day to do some sightseeing around Anchorage. Then we are all off to the Kenai River to fish (and sightsee) for the week. I’m not really an outdoorsy person, so this is a little out of my comfort zone, but I couldn’t pass up the opportunity for an Alaskan adventure! Have you ever been to Alaska? Any trips/recommendations? Alaska sounds like a blast, never been there, so can't wait to see what you there in July! ok, now i want to book tickets or hop in the car and go ANYwhere! hashtag I'm stealing your idea. Looks really cool! I hear you on the maps... I was trying to get a world one for my brother, he's been to Europe, Central America, South America, and who knows where else. But they are crazy expensive and GIGANTIC. I found one at Anthropology online but it's hard to gauge if it'd be too girly. Hmmm. I like this better though! Nice work you creative lady, you! Great way to showcase traveling adventures. Good idea Sam! Will be looking forward to your stories from Alaska.